"This recipe is similar in flavor to my chili recipe. I came up with it one night when I had a craving for chili. 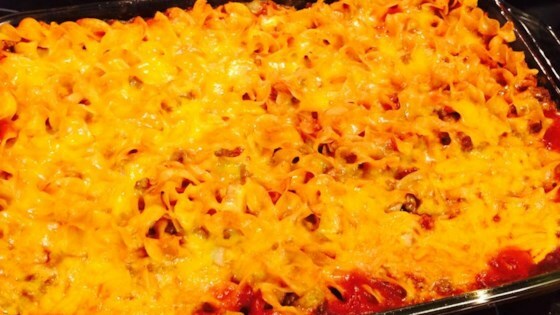 Because the kids will not eat beans, I substituted pasta and they loved it!" Preheat an oven to 350 degrees F (175 degrees C). Grease a 9x14 inch baking dish. Fill a large pot with lightly-salted water and bring to a boil; stir in the egg noodles and return to a boil. Stirring occasionally, boil uncovered until the pasta is cooked yet still firm to the bite, about 5 minutes. Drain well in a colander set in the sink. Place a large skillet over medium-high heat; cook and stir the ground beef in the skillet until completely browned. Add the onion and garlic; continue cooking and stirring until the onion is translucent. Pour all of the tomato sauce, water, and red wine into the mixture. Season with cumin, oregano, and cayenne pepper. Bring the mixture to a simmer. Mix the cooked pasta into the sauce; transfer the mixture to the prepared baking dish. Sprinkle the Cheddar cheese over the top of the pasta and sauce. Bake in the preheated oven until the cheese is melted and the sauce has absorbed into the dish, about 20 minutes. Your favorite flavors all brunched together! This is soooo good! My husband loved it! Very filling and great for a cold winter day. This is a great dish for a cold night. Great taste with just enough kick! Thought it was a little bland, but good. I'll have to play around with the wine (used cab sauv this time) and spices next time. Will definitely fix again. Followed recipe and added extra cheese and sour cream just before serving. I think I’ll mix in the sour cream just before baking the next time I make it. Kids LOVED it!